Following in the footsteps of other Dragon Trainers like Lance and Claire…and Iris…aaaaaand Drayden…she did come out in Gen 6 technically, with the Gen 3 remakes. Anyways, it’s Zinnia, now getting her own special card! Zinnia’s a Supporter that basically works like Lance <Prism>, in that one of your Pokemon gotta be KO’d first before you use it. With Zinnia though, you can attach 2 basic Energy cards to a Dragon Type Pokemon you control, powering them up in an instant. This is pretty useful for powering up the Dragon-Types very quickly, since it can either get you both of the required Energy Types you need for the ones that require that, or you can power up one of those that only require 1 Type of Energy even faster! Needless to say, Zinnia is incredibly beneficial support for the Dragon Type. Most decks would probably kill to have a card that powers up your Pokemon with 2 Energy! Course Dragons need that extra aid to make sure they get their proper mix in, so Zinnia is pretty helpful with that. Just make sure you’ve got enough in your deck that you don’t draw her too late in the game – since you need to have something get KO’d first! Arora Notealus: Zinnia’s an interesting character who didn’t appear until the Gen 3 remakes, where she played a starring role in the post-game involving Rayquaza. She’s not really antagonistic, as she’s just working to try and get Rayquaza to blow up a meteor heading towards the planet, so she’s…okay then? Maybe? Needless to say while her methods aren’t always the best, her heart’s in the right place…and taken over by DRAGONS!! Weekend Thought: Did you enjoy the Dragon Majesty set? Any cards you think deserve recognition in the set? Think there will be any major hits from this set? Will Dragons make a return as a great deck? Our number one pick is Zinnia from Dragon Majesty. As usual, we’ll be going through the attributes of the card and it’s effects. Being a Supporter card means you can only use one per turn outside of obscure gimmicks such as Magnezone’s Dual Brains ability and Sylveon’s Wink Wink attack that uses another Supporter of your turn. It also has a condition where one of your Pokemon would be KOed during your opponent’s last turn, so timing is important. When you get past those limitations, it lets you put two basic energy cards from your hand to one of your Dragon Pokemon. Given the conditions, Zinnia is meant to be a catch up card, and to make the most of it, you would have to have at least three energy cards in your hand: one for your manual attachment and two for the Supporter. This could help Dragons meet some of the attack costs assuming you have the exact energy because some dragons have attacks that cost at least two different energy types. For Standard, that’s probably your only method of accelerating energies to your dragon Pokemon. Expanded, however, has Double Dragon Energy that coves two units of energy for all types. Other non-specific cards that accelerate energy could be Max Elixir for Basic Pokémon, so that saves you from using Zinnia. Zinnia (DRM 70) tops our brief countdown of the best cards from the Dragon Majesty expansion set. This card allows you to attach two Basic Energy cards from your hand IF one of your Pokemon was KO’d in the prior turn. I think this means you get a total of three attachments from your hand during the turn you play this card, but please feel free to correct me if I’m wrong on this. Zinnia makes Dragon Pokemon VERY playable. Pair this with Ribombee (BUS 96), and you’ll more than likely be able to power up just about any Dragon Pokemon in the turn you play this card. As mentioned on Wednesday, Dragon Pokemon have a clear strategical development path in playing Lance Prism Star followed successively by Zinnia to power up those Pokemon Lance dropped on the bench. And Zinnia will be a four of in Dragon decks to facilitate Dragon Pokemon being able to immediately return attacks upon the Pokemon that just KO’d one of your Pokemon. This archetype is trending towards being one of the best counter attack strategies in the PTCG since I started playing and is probably the best direct response card since Teammates (PRC 141). Zinnia actually reminds me of Forest of Giant Plants (AOR 74) in that her ceiling will be limited only by the quality of Dragon Pokemon in the meta… and we’ve got some pretty good ones in the format right now. 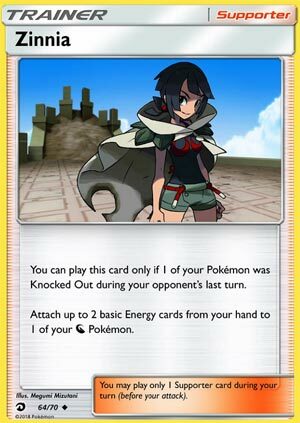 She does have a downside in that if you play Lance first and then play Zinnia again, that means you’ve already gone down at least two prizes… and possibly might have dropped as many as four (or five … when we get Tag Team Pokemon) prizes before you get to take advantage of this card. I will definitely say this: while there was no Zoroark GX in Dragon Majesty, there were a lot of really good cards for the Fire and Dragon archetypes (yeah sorry Water not so much for you guys). Shining Legends was Zoroark GX and the dropoff after that was pretty severe. Granted, Zoroark GX is probably one of the top five cards in the history of the game, and there are a lot of Pokemon in this set that will be better than Raichu GX and Entei GX (although Mewtwo GX did see some play to counter Dawn Wings Necrozma GX’s Moon’s Eclipse GX). Still, overall Dragon Majesty has a lot more to offer than Shining Legends did, and I look forward to reviewing many of the cards that didn’t make our top 5. It attaches from the hand, so you’ll need three Energy cards in hand without using a Supporter to do it. At least two of the Energy in your hand need to be basic Energy cards. You can only use Zinnia after something of yours was KO’d specifically on your opponent’s turn. Burn, Poison, and Shrine of Punishment are the most likely work arounds. Put it all together, and you realize this is not a card for pushing ahead of your opponent, but for almost instantly readying your next attacker after your previous one was KO’d. Energy Retrieval may help here as you can reclaim the basic Energy cards that were attached to said previous attacker – assuming there were any – to immediately attach to something else with Zinnia. As a recovery card, you’ll only get so many chances to use it; if you’re running nothing but Pokémon-GX (for example), you’ll have all of two chances to use Zinnia. There’s also Lance [Prism Star]; simply put, it eats up one of those chances if you use it. Definitely an example of helpful cards clashing with each other. For the Standard Format, I think this mostly means a copy or two of this goes in any [N] deck that runs on mostly basic Energy cards and no, I don’t know how many will decks will qualify. The thing is, even though from-the-hand Energy acceleration isn’t the best form of Energy acceleration, even with the other conditions, is so potent it might be reason enough for decks to shift to mostly basic Energy cards. Expanded still has Double Dragon Energy, but also more anti-Special Energy effects; at first I thought Zinnia might be hopeless, but now I’m wondering what a deck built around mostly single-Prize Pokémon and basic Energy could do when it is a snap to rebuild your fallen attackers. As I’ve said all weeks, I’m not sure if it is possible to have a sanctioned Limited Format event given how Dragon Majesty is being distributed, but if you manage it, Zinnia becomes a potent but finnicky clutch card. Fewer Prizes means fewer chances to use her. You’ll need to pull her and some decent [N] Types, then luck into drawing them all at the right time plus having the extra basic Energy cards in hand. When it all comes together, though, pretty major swing.